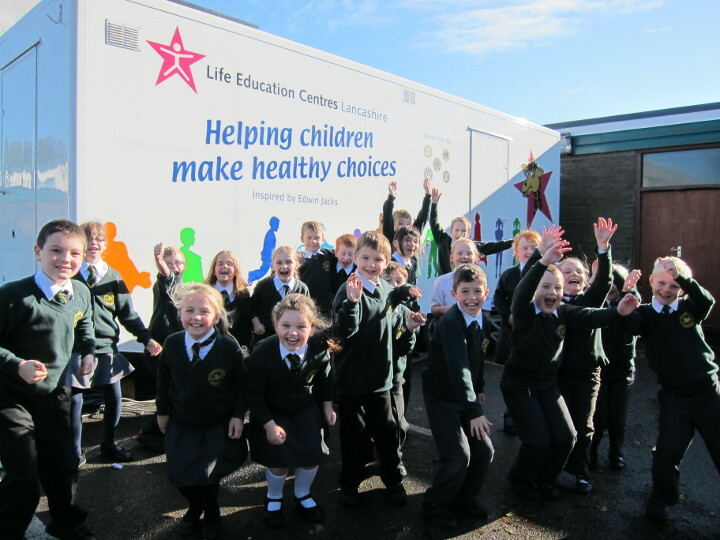 Life Education Lancashire works with schools throughout the county (including Blackburn with Darwen and Blackpool) and also Wigan and Sefton. No school is too large or too small to access the Life Education service, and we receive a warm welcome every year from over half the schools in our area (over 300) where we have been visiting schools for almost 22 years. The whole school community is excited to receive a visit; we teach children about the importance of making positive health choices, the value of friendships and the role these may play in decision-making. We look at both legal and illegal drugs, (including smoking and alcohol) in age-appropriate and memorable workshops that stay with children throughout their crucial teenage years, aiming to give children the knowledge, skills and resilience to make their own informed health choices. Our charity has five mobile classrooms, and five lovely educators. Please let us know if you would like us to visit your school. We charge schools per child on roll, and will stay at school an appropriate length of time depending on the size the school. The charges to schools are always the lowest we can manage and we subsidise all school visits from our fundraising. We aim to break even every year so that we are sustainable, but make Life Education affordable to schools at the same time. Keeping children safe online (our bCyberwise Workshop) is a very important and popular addition to our offer to schools. This includes looking at being a responsible internet citizen, thinking about online relationships and staying safe and the things that we may post on the internet and the reach this may have. Puberty (Time for Change) is another fantastic set of workhops that schools are welcoming for their older children. As we are a trusted provider for health and drugs workshops, this development has been welcomed by the schools we visit, as they know that this important topic will delivered be in a sensitive and clear way, giving children the opportunity to consider their concerns in a kind and safe environment. Six of the Best: We can also work with your TAs and Lunchtime Supervisors. This workshop covers positive behaviour management so that staff get the best out of children both in the classroom and the playground. Please call our local office if you are interested in any of the above, or if you would like the names of local schools we visit for a testimonial. Our office is based in Garstang, near Preston, and you can contact us for availability, a costing, or if you would like more information.